Koko the gorilla, famous for her sign language skills, died at age 46 in her sleep, according to the Gorilla Foundation. From her love for her pet cats to her ability to sign over 1,000 words and understand 2,000 words in the English language, Koko captivated the hearts of many. “Her impact has been profound and what she has taught us about the emotional capacity of gorillas and their cognitive abilities will continue to shape the world,” the Gorilla Foundation said in a release detailing the events of her death. Koko was born in 1971 at the San Francisco Zoo on July 4th, a date that inspired her name Hanabi-Ko which is Japanese for Fireworks Child. Francine “Penny” Patterson started working with Koko while she was a graduate student in 1972. Patterson, an animal psychologist began teaching Koko sign language and soon the western lowland gorilla was a national sensation. Koko’s abilities were unmatched and she proved that primate’s had far superior cognitive capabilities than was thought possible. In 2012, Koko amazed yet again when she played the recorder, which according to NPR, was something that researchers thought was impossible because it was assumed primates couldn’t control their breathing. In 1974, Patterson along with Ronald Cohn, a fellow researcher who worked closely with Koko established The Gorilla Foundation, and Koko has since been an ambassador for gorillas, raising awareness about the critically endangered group of species. 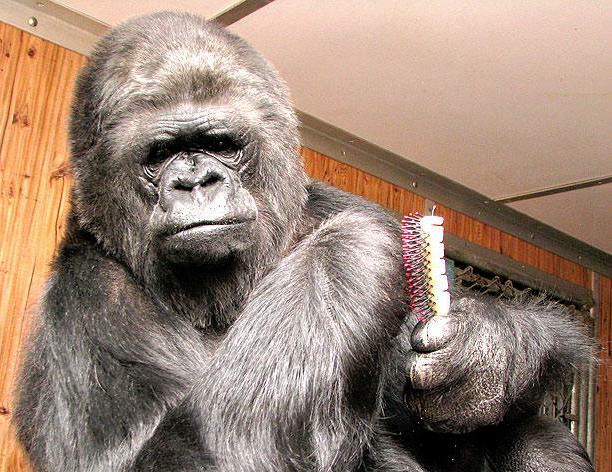 Koko was featured in National Geographic twice and a mirror selfie that Koko took herself was featured on the cover. One of the things Koko was most well known for, besides her sign language and kind nature, was her affinity and love for kittens. Koko was given a cat for her birthday which she named All Ball. Koko cared for the kitten, nurturing her and playing with the cat whenever she could. When All Ball died, Koko was reportedly distraught but was soon given more cats to care for through the years. Those critical of Patterson’s work have suggested that Koko did not actually understand the words she was singing, but instead was just copying the behavior of her caretakers. Whether or not Koko was an excellent mimic or truly had a grasp for language, her interaction with humans and other species shows a profound ability for communication. Koko has left a lasting impression and she will be greatly missed by those who have followed the gorilla’s journey and milestones.